^ Grossman, Lev (18 July 1998). "New Free License to Cover Content Online". Netly News. Archived from the original on 19 June 2000. Retrieved 12 January 2010. ^ a b c Wiley, David (1998). "Open Content". OpenContent.org. Archived from the original on 28 January 1999. Retrieved 17 April 2012. ^ a b c d Wiley, David. "Open Content". OpenContent.org. Retrieved 18 November 2011. ^ "Lawrence Liang, "Free/Open Source Software Open Content", ''Asia-Pacific Development Information Programme: e-Primers on Free/Open Source Software'', United Nations Development Programme – Asia-Pacific Development Information Programme, 2007" (PDF). Retrieved 23 June 2012. ^ "Revision history of "Definition" – Definition of Free Cultural Works". Freedomdefined.org. Retrieved 14 November 2012. ^ a b c "History – Definition of Free Cultural Works". Freedomdefined.org. Retrieved 14 November 2012. ^ "Resolution:Licensing policy". Wikimedia Foundation. Retrieved 14 November 2012. ^ "Approved for Free Cultural Works". Creative Commons. 24 July 2009. Retrieved 14 November 2012. ^ Geser, Guntram (January 2007). Open Educational Practices and Resources. OLCOS Roadmap 2012. Salzburg, Austria: Salzburg Research, EduMedia Group. p. 20. Retrieved 6 November 2010. ^ "Open Definition". OpenDefinition.org. Retrieved 18 November 2011. ^ Kantrowitz, Mark (2012). "Tuition Inflation". FinAid.org. Retrieved 18 April 2012. ^ Admin (2012). "Open.edu: Top 50 University Open Courseware Collections". DIY Learning. Retrieved 18 April 2012. ^ a b Fitzgerald, Bill (2012). 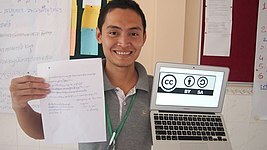 "Using Open Content To Drive Educational Change". Funny Monkey. Retrieved 18 April 2012. ^ Moushon, James (2012). "e-Textbooks: How do they stack up against tradition textbooks". Self Publishing Review. Retrieved 18 April 2012. This page was last edited on 24 January 2019, at 23:31 (UTC).